· Most physicians or paramedical personnel who are not familiar with artificial pacemakers will find any discussion on cardiac pacemakers difficult and complicated. This chapter will provide a simplified and basic discussion of the electrocardiogram (ECG) of cardiac pacemakers. · Artificial cardiac pacemakers are electronic devices that were clinically introduced for the treatment of symptomatic bradyarrhythmias. The device consists of a generator and one or more electrodes. The generator includes the circuitry and power supply, which are encased in a sealed container made of stainless steel or titanium. It is usually the size of a cigarette lighter and is implanted subcutaneously in the pectoral or subclavicular region. The generator is connected to the heart by electrodes, which are inserted transvenously into the right atrium, right ventricle, or to both chambers. · Initial classification: Permanent cardiac pacemakers were initially classified as atrial, ventricular, or dual chamber pacemakers (Fig. 26.1). o Atrial: An atrial pacemaker is a single chamber device consisting of a generator with an electrode inserted into the right atrium. o Ventricular: A ventricular pacemaker is a single chamber device consisting of a generator with an electrode inserted into the right ventricle. o Dual chamber: A dual chamber pacemaker is a device with two separate electrodes: one in the right atrium and the other in the right ventricle. 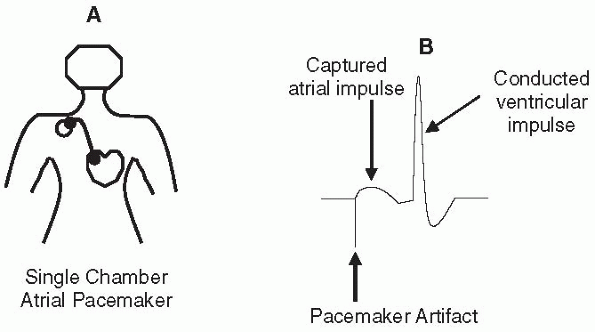 Figure 26.1: Diagrammatic Representation of the Different Types of Pacemakers. (A) atrial pacemaker. (B) ventricular pacemaker. (C)Dual chamber pacemaker. · Single chamber ventricular pacemaker: A basic knowledge of the function of a single chamber pacemaker is essential. This will serve as a foundation in understanding the ECG of the more complicated devices. Single chamber ventricular pacemakers were the earliest pacemakers that were put into clinical use for the treatment of complete atrioventricular (AV) block. These electronic devices can initiate a ventricular rhythm by emitting an electrical impulse directly to the ventricles. · The electrical impulse is represented in the ECG as a vertical artifact. The presence of a pacemaker artifact is a signal that the pacemaker has discharged and the wide QRS complex that immediately follows indicates that it has captured the ventricles (Figs. 26.2 and 26.3). · Single chamber atrial pacemaker: An atrial pacemaker can be identified in the ECG by the presence of a pacemaker artifact similar to that of a ventricular pacemaker. The pacemaker signal however is immediately followed by a P wave (instead of a QRS complex), which indicates that the pacemaker has captured the atrium (Figs. 26.4 and 26.5). · Single chamber atrial pacemakers were clinically introduced for the treatment of symptomatic bradyarrhythmias resulting from sick sinus syndrome. When the atrium is stimulated, the impulse can propagate to the ventricles and AV synchrony is preserved. Atrial pacing is, therefore, more physiologic than ventricular pacing. · Single chamber atrial pacemakers are indicated only when AV conduction is intact. They are not indicated for the treatment of complete AV block. Figure 26.2: Single Chamber Ventricular Pacemaker. (A) Diagrammatic representation of a single chamber ventricular pacemaker. The electrocardiogram generated by a ventricular pacemaker is shown in (B). Arrow points to the pacemaker artifact, which generates a wide QRS complex representing a captured ventricular impulse. · Fixed rate pacemakers: The earliest implantable pacemakers were capable only of stimulating the heart by delivering electrical impulses to the ventricle or atrium. They were not capable of recognizing or sensing the patient's spontaneous rhythm. The device therefore did not have any sensing capabilities and discharged constantly regardless of the patient's rhythm. These pacemakers were called fixed rate or asynchronous pacemakers (Fig. 26.6). · Demand pacemakers: To avoid competition between the pacemaker and the patient's own rhythm, the second-generation pacemakers were equipped with a sensing circuit capable of detecting (or sensing) the patient's intrinsic ventricular or atrial impulses. When a spontaneous ventricular or atrial complex is detected, the pacemaker was inhibited from delivering a stimulus (Fig. 26.7). These devices were called demand or synchronous pacemakers. Figure 26.3: Ventricular Pacemaker. rhythrn strip showing a ventricular pacemaker. Each pacemaker stimulus (arrow) is followed by a wide QRS complex representing a pacemaker captured ventricular complex. Figure 26.4: Single Chamber Atrial Pacemaker. (A) A diagrammatic representation of an atrial pacemaker. (B) The electrocardiogram generated by an atrial pacemaker. The pacemaker stimulus is followed by a P wave, which represents a pacemaker captured atrial complex. If atrioventricular conduction is intact, the P wave is followed by a normally conducted QRS complex. · As pacemaker function became increasingly more advanced, a coding system was developed to identify the different modes or functions that a pacemaker is capable of. The first universally accepted pacemaker coding system was developed by the Intersociety Commission on Heart Disease Resources. The initial coding system consisted only of three letters, which identified the type and basic function of the pacemaker. o The first letter identifies the chamber paced. This could be the A, atrium; V, ventricle; or D, dual (both atrium and ventricle). o The second letter indicates the chamber sensed. This could be the A, atrium; V, ventricle; D, dual (both chambers); or the number 0, none. o The third letter describes the pacemaker response to a sensed event that could be I, inhibited; T, triggered; D, dual (atrial inhibited followed by ventricular triggered); or the number 0, none. · Thus, a fixed-rate, single-chamber ventricular pacemaker, which is a pacemaker without sensing capabilities, is designated as V00 and a demand ventricular pacemaker, which has sensing capabilities, is a VVI or VVT. The same modes can be applied to atrial pacemakers; thus, a fixed rate, single chamber atrial pacemaker is designated as A00 and a demand atrial pacemaker, which has sensing capabilities, is AAI or AAT. · As pacemaker technology became more complex, the North American Society of Pacing and Electrophysiology and the British Pacing and Electrophysiology Group expanded the pacemaker code from three to five letters (Table 26.2). o The fourth letter identifies programmable features of the pacemaker (P, programmability is simple. M, multiprogrammable when three or more programmable features are present. 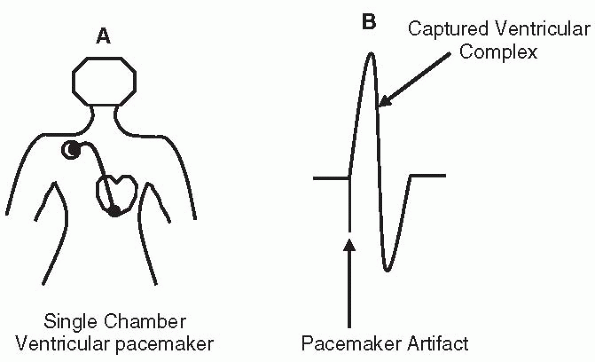 C, communicating: the pacemaker communicates by transmitting stored information to a programmer as opposed to a programmer sending commands to the pacemaker. R, rate modulating, the pacemaker has features capable of increasing its rate automatically during stress or exercise. 0, none. o The fifth letter identifies whether the pacemaker is capable of terminating tachyarrhythmias (P, pacing is used to terminate tachyarrhythmias; S, shock is used to terminate tachyarrhythmias; D or dual, both pacing and shock can terminate an arrhythmia). · Thus, a VVI pacemaker that has the capacity to vary its rate is a VVIR and the same pacemaker that uses burst pacing to terminate a tachyarrhythmia is a VVIRP. Figure 26.5: Atrial Pacemaker. Rhythm strip showing an atrial pacemaker. Each pacemaker stimulus (arrows) is followed by a P wave representing a pacemaker-captured atrial complex. Figure 26.6: Fixed Rate Ventricular Pacemaker. Fixed rate ventricular pacemakers do not have sensing capabilities and stimulate the ventricles constantly (arrows), regardless of the patient's underlying rhythm. Rhythm strip shows a fixed rate ventricular pacemaker. Note that the pacemaker is firing constantly causing a pacemaker stimulus to be delivered after a spontaneous ventricular complex (first star). The pacemaker impulse was not captured (block arrow) because the ventricles are still refractory from the ventricular impulse. · There are three possible single chamber ventricular pacemaker modes: V00, VVI, and VVT. · V00 mode: This is the code for a fixed rate ventricular pacemaker. o The first letter, V, stands for ventricle, which is the chamber paced. The second letter, 0, indicates that the device has no sensing capabilities. The third letter characterizes the mode of response to a sensed event. Because the pacemaker has no sensing capabilities, the third letter is automatically 0.
o V00, or fixed rate ventricular pacemaker, is the first permanent pacemaker introduced for the treatment of symptomatic AV block. It stimulates the ventricles at a constant rate regardless of the underlying rhythm (Fig. 26.8). Because the pacemaker does not have any sensing capabilities, competition always occurs between the patient's own intrinsic rhythm and that of the constantly delivered pacemaker stimuli. As a result, some pacemaker impulses are delivered to the ventricle even when the ventricles are completely refractory. Other impulses may occur at the end of the T wave of a spontaneous ventricular complex, which corresponds to the vulnerable period of the cardiac cycle (Fig. 26.9). This can potentially precipitate a cardiac arrhythmia. · VVI mode: This is the code for a demand ventricular pacemaker. o The first letter, V, indicates that the ventricle is the chamber paced. The second letter, V, means that the device is capable of sensing intrinsic impulses from the ventricles. The third letter, I, indicates that the pacemaker is inhibited (meaning that it will not deliver a ventricular stimulus) when it senses a ventricular event. o VVI pacing is an upgraded version of a V00 pacemaker. It is capable not only of stimulating the ventricles, but is also able to sense impulses originating from the ventricles. When the pacemaker senses a native QRS complex, the pacemaker is inhibited from delivering a pacemaker stimulus. Thus, competition between the patient's rhythm and that of the pacemaker is prevented (Fig. 26.10). o VVI pacing is the most commonly utilized among the three ventricular pacemaker modes. Even in the era of modern dual chamber pacing, VVI pacing is the pacemaker mode of choice when there is complete AV block and permanent atrial fibrillation (Fig. 26.11). · Hysteresis: In VVI pacing, the interval between two consecutive pacemaker stimuli is constant and is the same as the interval between a sensed ventricular complex and the next pacemaker stimulus (Fig. 26.12). VVI pacemakers, however, can be programmed to have a much longer escape interval. This longer escape interval is called hysteresis and is shown in Figure 26.13. · Hysteresis was intended to give the patient a chance to manifest his own rhythm, which is often more effective than an artificially paced rhythm. A long hysteresis should not be mistaken for pacemaker malfunction. · Oversensing: In VVI pacing, the pacemaker is inhibited when it senses a native QRS complex. The pacemaker may also be inhibited by extraneous artifacts such as muscle tremors (myopotentials) or electromagnetic interference, especially those generated by large motors. This type of pacemaker inhibition other than those due to the patient's intrinsic rhythm is called oversensing. Extraneous artifacts, especially those resulting from electromagnetic interference, may inhibit the pacemaker output because the pacemaker erroneously senses these extraneous artifacts as the patient's intrinsic rhythm. Because these electrical artifacts have a faster rate than the programmed rate of the pacemaker, the pacemaker is inhibited and is prevented from delivering a pacemaker output. If the patient is pacemaker-dependent, prolonged inhibition of the pacemaker may result in syncope. · Oversensing has been minimized and is no longer a problem with modern-day pacemakers with the use of bipolar instead of unipolar electrodes and insulating the pacemaker generator with a metallic shield to prevent oversensing of myopotentials. Use of electrocautery close to the generator during surgery, however, still poses a potential problem, which can inhibit a pacemaker in VVI mode. This can be prevented by programming the pacemaker to fixed rate mode before the surgery. Applying a magnet over the generator whenever electrocautery is activated can also temporarily convert the pacemaker from VVI mode to a fixed rate or V00 mode (Fig. 26.14). · VVT mode: This is the code for a ventricular triggered pacemaker. o The first letter, V, indicates that the ventricle is the chamber paced. The second letter, V, means that the device is capable of sensing intrinsic impulses from the ventricles. The third letter, T, indicates that the pacemaker is triggered when it senses a ventricular event (meaning that when a ventricular impulse is sensed, the pacemaker will respond by delivering a stimulus). o When the pacemaker senses a native ventricular complex, a pacemaker artifact is emitted, which is buried within the sensed QRS complex (Fig. 26.15). A triggered response is the pacemaker's way of acknowledging that the ventricular impulse was sensed. A triggered response within the QRS complex is harmless; however, the frequency of pacemaker output is increased and is not energy efficient. Its main advantage is that when there is oversensing of myopotentials or extraneous artifacts, VVT pacing may prevent asystole in patients who are pacemaker-dependent by delivering a ventricular output as opposed to a pacemaker in VVI mode, which is inhibited by these extraneous artifacts. o Triggered responses are no longer used in single chamber pacemakers, but are commonly used in dual chamber pacing. For example, when one chamber such as the atria senses a native atrial complex, the dual chamber pacemaker is triggered to deliver an output to the ventricles after a programmed interval to preserve AV synchrony (see Dual Chamber Pacemakers). Figure 26.7: Demand Ventricular Pacemaker. Demand ventricular pacemakers are capable of recognizing the patient's intrinsic rhythm. When a spontaneous ventricular complex is detected (stars), the pacemaker is inhibited from delivering a stimulus to the ventricle; thus, competition between the pacemaker and the patient's own spontaneous rhythm is prevented. The first letter represents the chamber paced, the second letter the chamber sensed, and the third letter the pacemaker response to a sensed event. A, atrial; V, ventricle; D, dual; 0, none; I, inhibited; T, triggered. NASPE, North American Society of Pacing and Electrophysiology; BPEG, British Pacing and Electrophysiology Group; 0, none; A, atrium; V, ventricle; D, dual (atrium + ventricle); T, triggered; I, inhibited; D#, dual (triggered + inhibited); P, simple programmable; M, multiprogrammable; C, communicating; R, rate modulation; P*, pacing (antitachyarrhythmia); S*, shock; D*, dual (pacing and shock). Figure 26.8: V00 or Fixed Rate Single Chamber Ventricular Pacemaker. V00 pacemakers operate very satisfactorily when there is no competing rhythm as shown. Note that all pacemaker artifacts (arrows) are captured by the ventricles resulting in wide QRS complexes. Figure 26.9: V00 or Fixed Rate Ventricular Pacemaker. When fixed rate pacing is used, pacemaker artifacts are delivered constantly regardless of the patient's rhythm (arrows). If the patient has an intrinsic rhythm (stars), some pacemaker artifacts may be delivered at end of the T wave of the preceding intrinsic QRS complex (block arrows) corresponding to the vulnerable period of the cardiac cycle. Figure 26.10: VVI Pacing. In VVI pacing, the pacemaker is capable of stimulating the ventricles and sensing spontaneous ventricular impulses. The fourth complex is a spontaneous QRS complex (star), which was sensed by the pacemaker and was inhibited from delivering a ventricular impulse. Figure 26.11: VVI Pacing and Atrial Fibrillation. The rhythm is atrial fibrillation. The pacemaker was programmed to discharge at a rate of 60 beats per minute and was appropriately inhibited by the first five ventricular complexes. After the fifth complex, a long pause followed, which was appropriately terminated by a pacemaker stimulus resulting in a captured ventricular complex (arrow). The long pause measured 1,000 milliseconds, equivalent to a heart rate of 60 beats per minute. The numbers indicate the intervals in milliseconds between the ventricular complexes. Figure 26.12: VVI or Ventricular Demand Pacemaker. VVI pacemakers are capable of sensing spontaneous ventricular impulses (stars). When a ventricular impulse is sensed, the escape interval between a spontaneous ventricular complex and the next pacemaker spike (interval 1) is the same as the interval between two consecutive pacemaker spikes (interval 2). Figure 26.13: Hysteresis. Hysteresis is present when the escape interval after a sensed impulse (interval 1) is longer than the interval between two consecutive pacemaker stimuli (interval 2). The presence of hysteresis should not be mistaken for pacemaker malfunction. · Atrial pacemakers are similar to ventricular pacemakers except that the pacemaker generator is connected to the atrium instead of the ventricle. o A00 mode: A00 or fixed rate atrial pacemaker continuously stimulates the atrium regardless of the atrial rhythm (Fig. 26.16). o AAI mode: In atrial demand pacemaker, the pacemaker is inhibited from delivering a stimulus when a spontaneous atrial impulse is sensed (Fig. 26.17). o AAT mode:When the pacemaker is atrial triggered, the pacemaker is required to deliver a stimulus coinciding with the sensed P wave when a spontaneous atrial complex is sensed (Fig. 26.18). Figure 26.14: Application of a Magnet. Application of a magnet to the pacemaker generator will convert the device to a fixed rate mode. Thus, a VVI pacemaker is converted to a V00 pacemaker with application of a magnet as shown above. After the magnet is taken off the pacemaker, the pacemaker reverts to a VVI mode. · Pacemaker electrodes: Most pacemaker electrodes are endocardial electrodes and are inserted transvenously into the right atrium or right ventricle. The right atrial electrode is usually anchored to the right atrial appendage and the ventricular electrode at the apex of the right ventricle. In rare cases in which transvenous insertion is not possible, a myocardial or epicardial lead is sutured into the atrial or ventricular myocardium using a transthoracic or subcostal approach. · There are two types of pacemaker electrodes: bipolar and unipolar. o Bipolar: A bipolar electrode has the stimulating electrode (or cathode) at the tip of the catheter and the negative electrode (or anode) just below the cathode at a distance of about 10 mm (Fig. 26.19A). The short distance between the two terminals causes a smaller pacemaker artifact in the ECG and a smaller antenna effect; thus, the pacemaker is less affected by electronic artifacts. Virtually all pacemakers today have bipolar electrodes. o Unipolar: A unipolar electrode has the stimulating electrode (or cathode) at the tip of the catheter and the negative electrode (or anode) in the metal housing of the pacemaker generator (Fig. 26.19B). Because the flow of current extends from the apex of the right ventricle (where the cathode is located), to the pacemaker generator (where the anode is located), the pacemaker artifact is unusually large. The wide distance between the two electrodes also causes a large antenna effect, rendering the pacemaker vulnerable to interference by electromagnetic forces. · The location of the pacemaker electrode determines the morphology of the QRS complex. 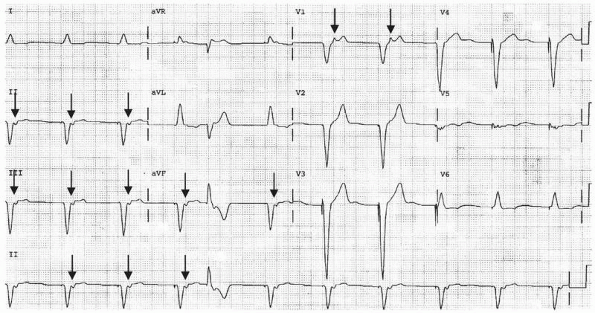 Stimulation of the right ventricle will result in a left bundle branch block configuration of the QRS complexes (Fig. 26.20). Stimulation of the left ventricle will generate a QRS complex with a right bundle branch block configuration (Fig. 26.21). Not all pacemaker-induced right bundle branch block patterns are due to left ventricular pacing, however. Figure 26.15: VVT or Ventricular Triggered Pacemaker. A pacemaker in VVT mode paces the ventricles. It can also sense spontaneous impulses from the ventricles. When a ventricular impulse is sensed, the pacemaker is immediately triggered to deliver a pacemaker stimulus as shown by the second and fifth complexes (stars). 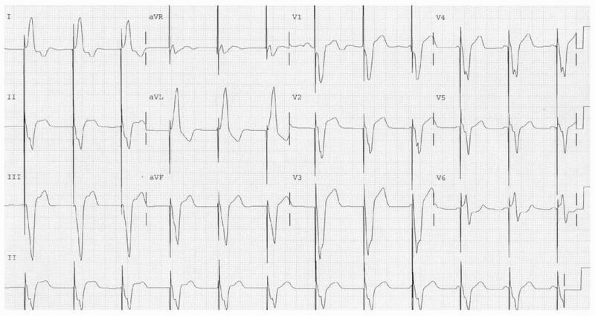 The triggered output is seen as an artifact buried within the patient's own QRS complex. Figure 26.16: Atrial Pacemaker in A00 Mode. A pacemaker in A00 mode constantly delivers an atrial output regardless of the atrial rhythm. It is not capable of sensing any atrial impulse. The third pacemaker artifact occurred after an intrinsic P wave and was not captured. The fourth pacemaker artifact was able to capture the atrium and the pacemaker induced P wave (arrow) was conducted to the ventricles resulting in a normally conducted QRS complex. Figure 26.17: AAI or Atrial Demand Pacemaker. In AAI mode, the atrium is paced. When an atrial P wave is sensed (star), the pacemaker is inhibited from delivering an atrial stimulus. Figure 26.18: AAT or Atrial Triggered Pacemaker. A pacemaker in AAT mode is similar to a pacemaker in AAI mode except that the pacemaker is triggered to deliver a pacemaker stimulus (star) when it senses an atrial event. Figure 26.19: Bipolar and Unipolar Electrodes. (A) A bipolar electrode. Both positive and negative electrodes are a short distance from each other within the area of the right ventricle. (B) A unipolar electrode. The stimulating electrode or cathode is located at the tip of the catheter and the negative electrode is in the metal housing of the pacemaker generator. Figure 26.20: Right Ventricular Pacing. When the stimulating electrode is in the right ventricle, the QRS complexes have a left bundle branch block configuration with deep S waves in V1-V2. · Pacemaker syndrome: Symptoms of low output, hypotension, and even syncope or near syncope can occur in patients with cardiac pacemakers, especially in VVI mode. This constellation of symptoms during ventricular pacing is called the pacemaker syndrome. Pacemaker syndrome can occur if there is retrograde conduction of the ventricular impulse to the atria (Fig. 26.22), causing both atria and ventricles to contract simultaneously. When the atria contracts against a closed mitral and tricuspid valves, pulmonary venous hypertension, low cardiac output, and reflex hypotension can occur. This can be minimized with insertion of a dual chamber cardiac pacemaker. Figure 26.21: Left Ventricular Pacing. A transvenous catheter was inserted into the left ventricle after inadvertently crossing a patent foramen ovale. Note that the QRS complexes in V1 have right bundle branch block configuration indicative of left ventricular pacing. · Dual chamber pacemakers: Dual chamber pacing was introduced to preserve AV synchrony. It has separate electrodes, one in the ventricle and the other in the atrium. Dual chamber pacing is easy to recognize in the ECG when there are two separate pacemaker stimuli, one capturing the atria and the other the ventricles. Its function is more complicated than a single chamber device because it combines atrial and ventricular sensing with atrial and ventricular pacing. · The different ECG patterns associated with a dual chamber pacemaker are shown in Figure 26.23. Figure 26.22: Ventriculoatrial Conduction during VVI Pacing. Ventriculoatrial (V-A) conduction or conduction of the ventricular impulse to the atria can occur during ventricular pacing resulting in retrograde P waves. The P waves are seen after the QRS complexes (arrows) and are due to retrograde conduction of the ventricular impulse to the atria across the AV conduction system. Pacemaker syndrome is due to simultaneous contraction of both atria and ventricles when there is V-A conduction. V-A conduction is possible even in patients with complete AV block. Figure 26.23: Dual Chamber Pacemaker. (A) A diagrammatic representation of a dual chamber pacemaker. (B) The different electrocardiogram patterns associated with a dual chamber pacemaker. · DDD Pacing: Among several dual chamber pacemaker modes, DDD pacing is the most commonly used. It is called universal pacemaker because it is the only pacemaker that can pace and sense both chambers separately. Figures 26.24,26.25,26.27,26.28 show the possible ECG findings associated with DDD pacing. o In DDD pacing, the pacemaker is capable of sensing impulses from both atrium and ventricle. When the pacemaker senses an atrial impulse, the atrial channel is inhibited from delivering an atrial stimulus. Inhibition of the atrial channel triggers the ventricular channel to deliver a stimulus to the ventricle after a programmed interval. However, if a spontaneous ventricular impulse is sensed, the pacemaker will be inhibited from discharging a pacemaker stimulus. o DDD pacing is the most physiologic among all available pacemakers and was introduced to preserved AV synchrony. 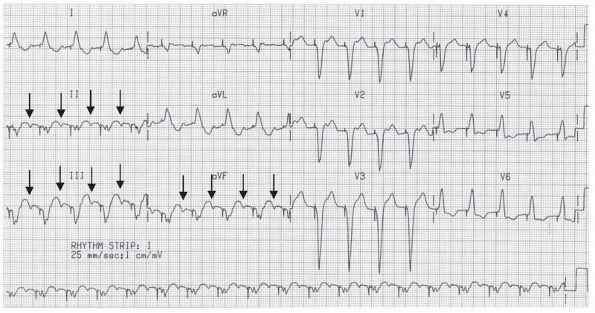 · Other ECG presentations of DDD pacing are shown in Figs. 26.26,26.27,26.28. · Indication: DDD pacing is the pacemaker mode of choice when there is complete AV block with intact sinus function. The pacemaker can track the atrial rate and triggers a ventricular output for every atrial impulse that is sensed. The pacemaker therefore is rate-responsive because spontaneous increase in atrial rate is always followed by a pacemaker-induced ventricular response. Thus, when the patient develops sinus tachycardia during stress or exercise, the ventricular rate increases commensurately, because the pacemaker is committed to deliver a ventricular output after every sensed atrial event (Fig. 26.29). · Contraindication: DDD pacing, however, is not appropriate for all clinical situations. Although DDD pacing is the pacemaker mode of choice among patients with complete AV block with intact sinus function, it is contraindicated when there is permanent atrial fibrillation. DDD pacing is not appropriate when there is atrial flutter or fibrillation because every sensed atrial event will trigger a ventricular output (Figs. 26.30 and 26.31). Furthermore, it is not possible to pace the atrium when there is atrial flutter or atrial fibrillation. In this setting, a VVI pacemaker is the pacemaker mode of choice. · Mode switching: When atrial flutter or fibrillation is paroxysmal or recurrent, some DDD pacemakers are capable of mode switching when the supraventricular arrhythmia is detected. For example, in patients with DDD pacemakers, the pacemaker mode switches automatically from DDD to VVI mode when atrial fibrillation is detected and back to DDD when the arrhythmia spontaneously converts to normal sinus rhythm. If a DDD pacemaker is not capable of automatic mode switching, it should be programmed to a VVI mode. Figure 26.24: Dual Chamber Pacemaker without any Competing Rhythm. 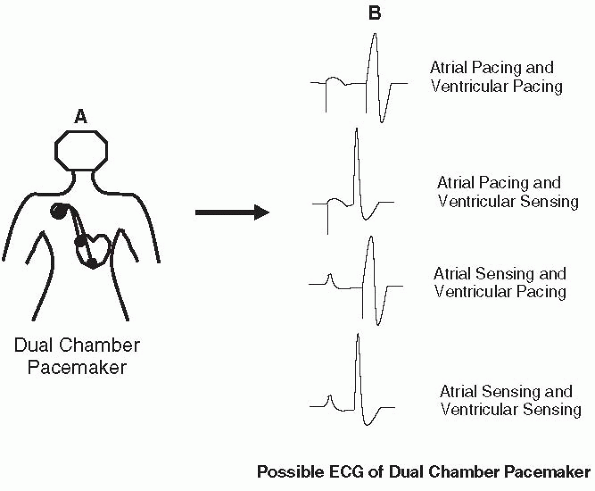 The presence of separate atrial (A) and ventricular (V) stimuli suggest that the pacemaker is dual chamber. Atrial pacing followed by ventricular pacing is one of the possible electrocardiogram patterns of a DDD pacemaker. Figure 26.25: DDD Pacing: Atrial Pacing Followed by a Spontaneous Ventricular Rhythm. Another electrocardiogram pattern of DDD pacing is the presence of pacemaker induced atrial complexes, which may conduct normally to the ventricles. The pacemaker senses the normally conducted ventricular complexes (VS) resulting in inhibition of the ventricular output hence no ventricular pacemaker artifact is present. AP, atrial pacing; VS, ventricular sensing. Figure 26.26: DDD Pacing: Normal Sinus Rhythm followed by Paced Ventricular Rhythm. DDD pacing can also present with sinus P waves followed by pacemaker-induced QRS complexes. When sinus rhythm is present, the sensed P waves inhibit the atrial output and at the same time triggers the pacemaker to deliver a ventricular output after a programmed atrioventricular interval. Thus, when sinus tachycardia occurs, every P wave will be followed by a QRS complex. Figure 26.27: DDD Pacing: Normal Sinus Rhythm with Normal Atrioventricular Conduction. In DDD pacing, the presence of spontaneous atrial and ventricular complexes may inhibit the pacemaker output completely. This will allow the patient to manifest his or her own rhythm without evidence of pacemaker activity. Figure 26.28: DDD Pacing. This rhythm strip summarizes all the possible combinations for DDD pacing. AP, atrial pacing; AS, atrial sensing; VP, ventricular pacing; VS, ventricular sensing. Figure 26.29: Pacemaker in DDD Mode Tracking Sinus Tachycardia. Sinus tachycardia is present with upright P waves in leads I, II, and aVF. DDD pacing can track the atrial rate committing the pacemaker to deliver a ventricular output for every sensed atrial event. DDD pacing is the pacemaker of choice when complete atrioventricular block is present with intact sinus node function. Figure 26.30: DDD Pacing During Atrial Fibrillation. During atrial fibrillation, a pacemaker in DDD mode can track the atrial rate and delivers a ventricular output after every sensed atrial event resulting in a fast ventricular rate as shown above. DDD pacing therefore is not appropriate during atrial fibrillation. The pacemaker should be programmed to a VVI mode. See also Figure 26.11. Figure 26.31: DDD Pacing and Atrial Flutter. Rhythm strip A shows a dual chamber pacemaker in DDD mode in a patient with atrial flutter. Note that the pacemaker rate is relatively fast at approximately 115 per minute. Rhythm strip B was taken after the pacemaker was programmed to VVI mode. The rhythm is atrial flutter and the ventricular rate is slower at 60 per minute. Figure 26.32: Pacemaker-Mediated Tachycardia. 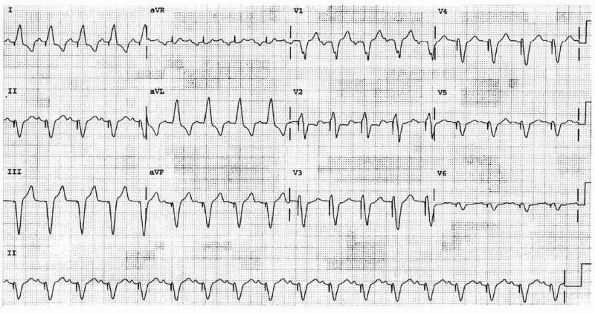 Twelve-lead electrocardiogram of a patient with pacemaker mediated tachycardia (PMT). PMT is possible only when there is ventriculoatrial (V-A) conduction (arrows), which are seen as retrograde P waves in II, III, and aVF. The P waves are sensed by the atrial channel triggering the pacemaker to deliver a ventricular output. Once the ventricles are stimulated, V-A conduction again occurs resulting in PMT. · Pacemaker-mediated tachycardia: One of the complications of DDD pacing is pacemaker-mediated tachycardia (PMT) (Fig. 20.32). This tachycardia is possible only when there is ventriculoatrial (V-A) conduction. V-A conduction refers to the conduction of an impulse retrogradely from ventricles to atria through the AV conduction system. V-A conduction has been shown to occur even in the presence of complete AV block. o When the ventricle is paced, the ventricular impulse can conduct retrogradely to the atria. The retrograde P wave is sensed by the atrial channel of the pacemaker and commits the pacemaker to deliver a ventricular output, which will again result in retrograde conduction. PMT can also occur in any dual chamber pacemaker in which a sensed atrial event can trigger a ventricular output such as VDD, VAT, and DDT modes. o PMT can be terminated by placing a magnet over the pacemaker generator, temporarily converting the pacemaker to a fixed rate or D00 mode or by reprogramming the pacemaker. · PMT can also be terminated by programming the pacemaker to DVI or VVI mode. Any programming that renders the atrial channel incapable of sensing retrograde P waves will terminate the tachycardia. · If the pacemaker has to remain in DDD mode, the pacemaker can be reprogrammed not to recognize the retrograde P wave. This is done by lengthening the atrial refractory period (ARP). During the ARP, the atrial channel is not able to sense any impulse (Fig. 26.33). The atrial refractory period starts with a paced or sensed atrial activity and continues until ventricular pacing or sensing. The ARP also extends beyond the QRS complex and is called postventricular atrial refractory period (PVARP). The duration of the PVARP is programmable. The PVARP is built into the pacemaker to prevent the atrium from sensing the ventricular output and QRS complex as an atrial event. 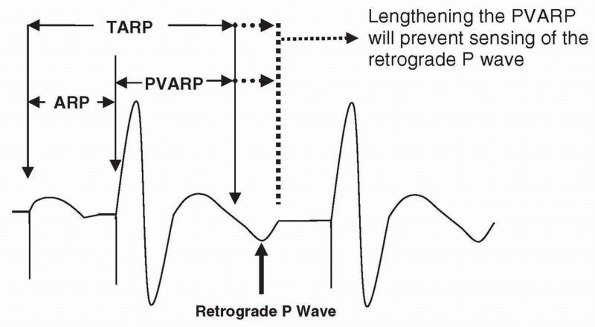 Lengthening the PVARP will prevent the pacemaker from sensing retrograde P waves because the retrograde P wave will now fall within the atrial refractory period. · An endless loop PMT should not be confused with sinus tachycardia during DDD pacing. When sinus tachycardia is present, the P waves are upright in II, III, and aVF (Fig. 26.34A). On the other hand, when PMT is present, the P waves are retrogradely conducted (ventriculoatrial conduction) and will be inverted in leads II, III, and aVF (Fig. 26.34B). · Very often, a pacemaker tachycardia can also occur when there is atrial flutter or atrial fibrillation (Figs. 26.30, 26.31, and 26.35). Figure 26.33: Atrial Refractory Period in DDD Pacing. The atrial refractory period (ARP) starts with atrial pacing and continues until ventricular pacing or ventricular sensing. This corresponds to the whole atrioventricular or PR interval and indicates the time that the atrial channel is unable to sense any impulse. The ARP also continues beyond ventricular pacing (or sensing). This portion of the atrial refractory period is called the postventricular atrial refractory period (PVARP). The length of the PVARP is programmable. The total atrial refractory period (TARP) includes the ARP and the PVARP. During the TARP, the atrial channel is deft to any impulse. If there is PMT, the PVARP can be programmed to a longer interval (dotted line) so that it will not sense the retrograde P wave. · The ECG of other, less commonly encountered dual chamber pacemakers are shown. · VAT mode: The pacemaker is an atrial synchronous pacemaker and was one of the earliest dual chamber pacemakers introduced clinically that can preserve AV synchrony (Fig. 26.36). o When an atrial impulse is sensed, the pacemaker is triggered to deliver a pacemaker stimulus to the ventricles. Thus, the ventricles are stimulated only when a spontaneous atrial impulse is sensed. When there is no spontaneous atrial rhythm, the pacemaker acts like a V00 pacemaker because the pacemaker does not sense ventricular impulses. o The main drawback of VAT pacing is that sensing occurs only in the atrium. Thus, spontaneous ventricular complexes are not sensed and the pacemaker can deliver electrical stimuli to the ventricles even when there are spontaneous QRS complexes. · DVI Pacing: Also called A-V sequential pacing. It was intended for patients with complete AV block (Fig. 26.37). o When the pacemaker senses a spontaneous ventricular complex, the pacemaker is inhibited from delivering a stimulus to the ventricles. Thus, the initial pacemaker stimulus is delivered to the atrium after a programmed escape interval. 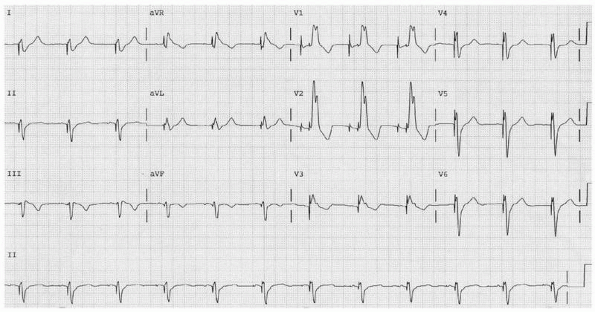 This interval is measured from the last spontaneous or pacemaker induced ventricular complex. After the atrium is paced, the ventricle is sequentially paced; however, if a spontaneous ventricular impulse is sensed, the pacemaker stimulus will be inhibited. o Unlike VAT pacing in which the ventricles are stimulated even when a spontaneous ventricular complex is present, pacing in DVI mode prevents the pacemaker from delivering a stimulus to the ventricle if the pacemaker senses a spontaneous ventricular impulse. Because DVI pacing is not capable of sensing atrial impulses, AV synchrony is not preserved. · VDD mode. In VDD mode, only the ventricle is paced. Sensing occurs in both chambers. The pacemaker is not capable of pacing the atrium; however, when an atrial impulse is sensed, the pacemaker is triggered to deliver a ventricular output. If the pacemaker senses a spontaneous ventricular complex, it is inhibited from delivering a pacemaker stimulus to the ventricles. The pacemaker will function as a VVI pacer if it does not sense any spontaneous atrial complex (Fig. 26.38). · DDI pacing: In DDI pacing, the atrial or ventricular outputs are inhibited when atrial or ventricular impulses are sensed. Although atrial sensing occurs, the pacemaker is not triggered to deliver a ventricular stimulus, thus the pacemaker is not rate responsive (Fig. 26.39). Figure 26.34: DDD Pacing During Sinus Tachycardia (A) and Endless Loop Tachycardia (B). (A) Sinus tachycardia with P waves upright in lead II (arrows). The full 12-lead electrocardiogram (ECG) of sinus tachycardia followed by pacemaker induced ventricular response is shown in Figure 26.29. (B) Endless loop pacemaker mediated tachycardia. The P waves are inverted in lead II (arrows). The full 12-lead ECG of a pacemaker mediated tachycardia is shown in Figure 26.32. Figure 26.35: DDD Pacing with Mode Switching. (A) A dual chamber pacemaker in DDD mode. Ventricular pacing is seen with a rate of approximately 110 beats per minute, which is the maximum rate that is programmed for the pacemaker. The underlying rhythm is not obvious in the rhythm strip. Because the pacemaker is capable of mode switching, it automatically programs itself into a VVI mode (B)with a rate of approximately 70 beats per minute. The underlying rhythm is atrial flutter with atrioventricular block. The flutter waves are marked by the arrows. Figure 26.36: VAT mode. VAT pacing is the first atrial sensing dual chamber pacemaker put into clinical use that is capable of preserving atrioventricular (AV) synchrony. In VAT pacing, the ventricle is the only chamber paced and the atrium is the only chamber sensed. When a spontaneous atrial impulse is sensed, the ventricle is triggered after a programmed AV interval (first, second, fourth, and seventh complexes), thus the pacemaker can track the atrial rate and is rate responsive. Because a sensed P wave always triggers a ventricular output, AV synchrony is preserved. The drawback is that competition can occur when spontaneous ventricular rhythm is present because the pacemaker is not capable of sensing ventricular impulses (fifth and eighth complexes). When there is no atrial activity (third complex), the pacemaker will function in V00 mode. Arrows point to the pacemaker artifacts. Figure 26.37: DVI Mode. In DVI pacing, both atria and ventricles are paced. The ventricle is the only chamber sensed. In the absence of a competing rhythm, the atrium and ventricle are sequentially paced and the resulting electrocardiogram is shown in complexes 1 and 2. When a native ventricular impulse is sensed, the ventricular output is inhibited (third, fourth, and fifth complexes). When the ventricular rate drops below a preset rate (distance between third and fourth complexes), the pacemaker is committed to deliver an atrial output regardless of the atrial rhythm. Note that the atrial artifact in four was not followed by a ventricular output because the pacemaker was able to sense the native ventricular complex. It was not able to recognize the P wave in front of the QRS complex because DVI pacing is not capable of sensing atrial impulses (fourth complex). The pacemaker is not rate responsive since the pacemaker is not capable of sensing atrial impulses; thus, atrioventricular synchrony is not preserved. The arrows identify the pacemaker artifacts. (A represents atrial pacemaker artifacts and V represent ventricular pacemaker artifacts). Figure 26.38: VDD Mode. In VDD mode only the ventricle is paced. The pacemaker is capable of sensing impulses from both atrium and ventricle (first two complexes). When an atrial impulse is sensed, the pacemaker is triggered to deliver a ventricular output after a programmed atrioventricular (AV) interval (third and fourth complexes). When a ventricular complex is sensed, the pacemaker is inhibited from delivering a ventricular output (fifth complex). When the atrial rate is fast, the pacemaker can track the atrial rate and is therefore rate responsive similar to a DDD pacemaker. However, when the atrial rate is unusually slow or when there is no atrial activity (pause after the fifth complex), the pacemaker functions in the VVI mode (sixth complex) because the pacemaker is not capable of pacing the atrium and loses its advantage as a dual chamber pacemaker in preserving AV synchrony. · Pacemakers are also capable of terminating ventricular tachycardia. The rhythm strips in Figures 26.40 and 26.41 show a VVIRP pacemaker, which is capable of terminating ventricular tachycardia with burst pacing. This is usually accomplished by delivering a series of ventricular pacemaker stimuli in an attempt to capture the ventricles during the tachycardia. Figure 26.40 shows ventricular tachycardia terminated successfully by burst pacing. · In Figure 26.41, burst pacing was delivered inappropriately during a sinus tachycardia, which was mistaken for ventricular tachycardia. After burst pacing was completed, the rhythm had deteriorated from sinus tachycardia to ventricular tachycardia. Figure 26.39: DDI mode. Both atrium and ventricle are paced (first two complexes). The pacemaker is capable of sensing impulses from both atrium and ventricle. When an atrial impulse is sensed (star), the pacemaker is inhibited from delivering an atrial output. When a ventricular impulse is sensed (third and fifth complexes), the pacemaker is inhibited from delivering a ventricular output. When the atrial rhythm is unusually slow or when there is no atrial activity (pause after the fifth complex), atrial pacing is initiated when the lower rate limit of the pacemaker is reached (sixth complex). This is followed by a ventricular output unless a spontaneous ventricular complex occurs. Although the pacemaker is capable of sensing atrial impulses, the ventricular output is not triggered when an atrial impulse is sensed (star). The pacemaker therefore is not rate responsive since it is not capable of increasing the ventricular rate when the atrial rate increases during stress or exercise. · Biventricular pacemakers: Patients with wide QRS complexes resulting from left or right bundle branch block, severe left ventricular systolic dysfunction (ejection fraction ≤35%), and symptoms of heart failure in spite of optimal medical therapy are candidates for implantation of biventricular pacemakers. Biventricular pacing is performed by pacing both ventricles simultaneously, even in the absence of bradyarrhythmias from AV block or sinus node dysfunction. Biventricular pacing synchronizes ventricular contraction in patients with bundle branch block and has been shown to improve cardiac output in patients with wide QRS complexes who also have severe left ventricular dysfunction. The left ventricle is paced with an electrode inserted through the coronary sinus. The right atrium and right ventricle are paced conventionally. Patients with severe left ventricular dysfunction are also at risk for malignant ventricular arrhythmias. Thus, patients with heart failure requiring biventricular pacemakers are also candidates for implantation of devices with defibrillating properties. · Automatic implantable devices: Patients who are survivors of cardiac arrest or patients who are high risk for ventricular tachycardia or fibrillation are candidates for implantation of automatic cardioverter defibrillators. These devices are commonly integrated with biventricular pacemakers in patients undergoing cardiac resynchronization therapy. Thus, automatic implantable defibrillators are commonly integrated with pacemakers and permanent pacemakers are integrated with defibrillating properties, making them capable of treating both bradycardia and tachycardia. An example of a patient with an implantable cardioverter/defibrillator (ICD) whose ventricular tachycardia is terminated by delivery of an electrical shock is shown in Figure 26.42. Although the defibrillator also has pacemaking properties, pacemaker activity was not necessary after successful cardioversion. Figure 26.40: Overdrive Pacing Terminating Ventricular Tachycardia. The left side of the tracing shows ventricular tachycardia with a rate of 180 beats per minute. The pacemaker recognizes the ventricular tachycardia and delivers a burst of ventricular pacemaker stimuli, which is faster than the rate of the ventricular tachycardia. The pacemaker successfully captures the ventricles during pacing. When pacing is terminated, the rhythm is successfully converted to a slower ventricular rhythm followed by normal sinus rhythm. Figure 26.41: VVIRP. Rhythm strip shows a rate responsive VVI pacemaker with features capable of terminating a tachyarrhythmia using burst pacing (VVIRP). In the rhythm strip, the pacemaker mistook the sinus tachycardia for ventricular tachycardia and inappropriately delivered a burst of 10 ventricular pacemaker stimuli, which is successful in capturing the ventricles. When pacing was terminated, the rhythm had changed to ventricular tachycardia as noted at the end of the rhythm strip. · Permanent pacemakers were clinically introduced for the treatment of symptomatic bradyarrhythmias from complete AV block and sinus node dysfunction. Single chamber ventricular pacemakers were the first generation of implantable devices used for this purpose. Single chamber ventricular pacemakers, however, do not preserve AV synchrony. Furthermore, ventricular pacing can result in pacemaker syndrome. · Pacemaker syndrome is a hemodynamic consequence of ventricular pacing. This is mainly from retrograde or ventriculoatrial conduction of the paced ventricular impulse to the atria. This is characterized by cannon A waves in the neck from contraction of the atria when the mitral and tricuspid valves are closed. Increase in atrial and pulmonary venous pressures can occur when the atria are contracting against a closed AV valve, resulting in shortness of breath as well as reflex drop in blood pressure. This overall symptom complex of hypotension, shortness of breath, and low cardiac output is called the pacemaker syndrome. · Single chamber ventricular pacemakers have been replaced by dual chamber pacemakers, which are more physiologic, because AV synchrony is preserved. Although single channel AAI pacemakers can also preserve AV synchrony, they are limited to patients with intact AV conduction and are not indicated in the presence of complete AV block. VVI pacemakers remain the most commonly implanted pacemaker world-wide. In the United States, most pacemakers that are implanted are dual chamber devices in DDD mode. · VVI pacing continues to be the pacemaker mode of choice when complete AV block occurs in the setting of permanent atrial fibrillation. DDD pacing is contraindicated because it is not possible to pace the atrium when there is atrial flutter or fibrillation. Furthermore, the presence of atrial flutter or fibrillation will commit the pacemaker to deliver a ventricular output for every sensed atrial event resulting in unnecessary tachycardia. · Although single chamber atrial pacemaker is the most appropriate device for patients with sick sinus syndrome, dual chamber pacing in DDD mode is more often used. Sick sinus syndrome is most commonly the result of degenerative disease that affects not only the sinus node but may eventually involve the AV node and distal conduction system. · Pacemakers are sometimes inappropriately inhibited by extraneous impulses such as muscle tremors, electrocautery, microwaves, magnetic fields, and other artifacts. Oversensing of these artifacts has been minimized with the use of bipolar electrodes where the anode or negative electrode is mounted just a short distance from the tip of the catheter thus shortening the distance between the two electrodes and the size of the antenna. If electrocautery is performed during a surgical procedure, it should not involve the area of the pacemaker generator. If this cannot be avoided, the pacemaker can be programmed to a fixed rate mode or a magnet can be placed over the generator to temporarily convert the pacemaker to a fixed rate mode. Pacemakers with sensing capabilities (VVI, DDD pacemakers) are temporarily converted to a fixed rate (V00, D00) mode when a magnet is placed over a pacemaker generator. · Endless loop or pacemaker-mediated tachycardia can occur with DDD pacing as well as with other modes of pacing such as VDD, VAT, and DDT. The tachycardia can be terminated by reprogramming the pacemaker to other modes such as VVI or DVI or a magnet can be applied to the pacemaker generator, temporarily converting the pacemaker to a fixed rate or D00 mode. If the pacemaker needs to remain in DDD mode, the pacemaker can be programmed not to recognize the retrograde P wave by lengthening the refractory period of the atrial channel. · Permanent pacemakers: The indications for insertion of permanent pacemakers in patients with acquired AV block are discussed in Chapter 8, Atrioventricular Block; for patients with intraventricular conduction defect, in Chapter 11, Intraventricular Conduction Defect: Trifascicular Block; and for patients with sick sinus syndrome, in Chapter 12, Sinus Node Dysfunction. · Whenever there is a need for a permanent pacemaker, two other conditions should always be considered before the permanent pacemaker is implanted: the need for biventricular pacemaker in patients with bundle branch block and the need for ICD in patients with left ventricular dysfunction. o Biventricular pacemakers: Implantation of biventricular pacemaker (also called cardiac resynchronization therapy), is indicated in patients with a QRS duration of >0.12 seconds, who have systolic left ventricular dysfunction (ejection fraction ≤35%) and continue to have symptoms of heart failure (Class III or Class IV) in spite of optimal medical therapy for heart failure. Cardiac resynchronization is performed by pacing both ventricles simultaneously. Simultaneous pacing of both ventricles will significantly decrease the delay in the spread of electrical impulse to both ventricles when there is bundle branch block. Biventricular pacing has been shown to improve cardiac output in patients with wide QRS complexes. The patient should be in normal sinus rhythm so that timing of atrial and ventricular contraction can be synchronized. Although most patients who have received biventricular pacemakers have left bundle branch block, currently, the width of the QRS complex rather than the type of bundle branch block is the main indication for biventricular pacing. o Implantable cardioverter defibrillators: Patients with severe left ventricular dysfunction are at risk for sudden cardiac death due to ventricular tachycardia or ventricular fibrillation. These patients therefore are also candidates for implantation of ICD. § Secondary prevention: ICD may be implanted for secondary prevention of sudden cardiac death implying that these patients have experienced and survived a previous episode of cardiac arrest or sustained ventricular tachycardia. § Primary prevention: These patients have not experienced any previous arrhythmias or cardiac arrest but are high risk for ventricular tachycardia or ventricular fibrillation. For primary prevention of sudden cardiac death, the following are Class I indications for implantation of ICD according to the American College of Cardiology/American Heart Association/Heart Rhythm Society 2008 guidelines for device-based therapy of cardiac rhythm abnormalities. § Left ventricular ejection fraction <35% due to prior myocardial infarction (MI) who are at least 40 days post-MI and are in New York Heart Association (NYHA) functional Class II or III. § Nonischemic dialated cardiomyopathy with ejection fraction ≤35% and who are in NYHA functional Class II or III. § The following are Class IIa recommendations for primary prevention of sudden cardiac death. § Left ventricular dysfunction due to prior MI who are at least 40 days post-MI, have an ejection fraction <30% and are in NYHA functional Class I. § Selected patients with idiopathic hypertrophic subaortic stenosis who have 1 or more major risk factors for sudden cardiac death. This includes strong family history of sudden cardiac death, abnormal blood pressure response during exercise testing, unusually thick ventricular septum ≤3.0 cm, and spontaneous nonsustained VT or unexplained syncope. § Patients with arrhythmogenic right ventricular dysplasia or cardiomyopathy who have 1 or more risk factors for sudden cardiac death. This includes male gender, severe right ventricular (RV) dilatation and extensive RV involvement, LV involvement, young age (<5 years) and nonsustained ventricular tachycardia during monitoring or induction of ventricular tachycardia during electrophysiologic testing. · Similar to pacemakers, ICDs may be affected by electromagnetic interferences including those emitted by electronic article surveillance system, which are deployed as antitheft devices in shopping centers. This may cause the ICD to discharge inappropriately if the patient is exposed long enough to the effects of the antitheft device. Figure 26.42: Automatic Implantable Cardioverter Defibrillator (AICD). Rhythm strip showing a wide complex tachycardia on the left half of the rhythm strip. The AICD was able to recognize the ventricular tachycardia and automatically delivered an electrical shock (arrow) that successfully converted the rhythm to normal sinus (right side of the tracing). Bernstein AD, Camm AJ, Fletcher RD, et al. NASPE/BPEG generic pacemaker code for antibradyarrhythmia and adaptiverate pacing and antitachyarrhythmia devices. Pacing Clin Electrophysiol. 1987;10:794-799. Epstein AE, DiMarco JP, Ellenbogen KA, et al. ACC/AHA/HRS 2008 guidelines for device-based therapy of cardiac rhythm abnormalities: a report of the American College of Cardiology/American Heart Association Task Force on Practice Guidelines (Writing Committee to Revise the ACC/AHA/NASPE 2002 Guideline Update for Implantation of Cardiac Pacemakers and Antiarrhythmia Devices). Circulation. 2008; 117:e350-e408. Gimbel JR, Cox Jr, JW. Electronic article surveillance systems and interactions with implantable cardiac devices: risk of adverse interactions in public and commercial spaces. Mayo Clin Proc. 2007;82:318-322. Hayes DL. Pacemakers. In: Topol EJ, ed. Textbook of Cardiovascular Medicine. 2nd ed. Philadelphia: Lippincott Williams & Wilkins; 2002:1571-1596. Mower MM, Aranaga CE, Tabatznik B. Unusual patterns of conduction produced by pacemaker stimuli. Am Heart J. 1967; 74:24-30. Parsonnet V, Furman S, Smyth PD. A revised code for pacemaker identification. Pacemaker Study Group. Circulation. 1981;64:60A-62A. Surawicz B, Uhley H, Borun R, et al. Task Force I: standardization of terminology and interpretation. Am J Cardiol. 1978;41:130-144.